History: Working for some of the best and most well reputed restaurants in the world, Nick began his culinary journey as an apprentice in Bedfordshire, working his way up to commis chef at Roux Restaurants Limited establishment, Le Poulbot in London. After a year at 3 Michelin starred restaurant La Gavroche, Nick became head chef at Les Trois Plats before moving to continue his position at Le Poulbout. After moving to France in 1991, Nick took up the position of chef de partie at 2 Michelin starred restaurant Michel Chabran, before moving back to the UK to become a culinary consultant for Albert Roux Consultancy in London. 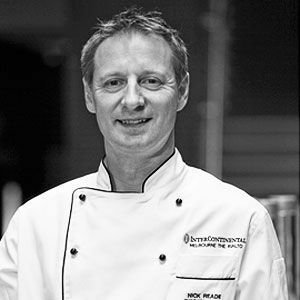 In 1998, Nick took up the position of executive chef at Amsterdam Marriott Hotel in The Netherlands, before heading to Australia to take up work at the Surfers Paradise Marriott Resort. After spending two years working in Thailand at JW Marriott Phuket Resort and Spa, Nick returned to Australia where, after working as executive chef for a number of establishments, he became the current owner/director of Dundas Place Cafe in Albert Park. Yes, for as long as I can remember. I always grew up eating fresh home baked foods. I guess I always had an interest in foods and cooking from a very early age. Traditional/classical with a modern twist. I love working with a lot of native Australian ingredients. There’s such an abundance of variety but they are very under-valued/utilised. Bees - I am an apiarist through and through. I set up and ran six bee hives on the top floor of the InterContinental Hotel in Melbourne. I’m absolutely fascinated by bees. Albert Roux (the first chef to earn 3 Michelin stars in the UK). I worked for him for more than 13 years. It was very hard, but an incredible experience. The ever-changing foods, drinks and trends. Boiled chicken feet for breakfast – not what a British country boy is looking for on his first trip to Hong Kong! Beef Wellington at OenoViva Restaurant – a good, no-nonsense dish.